Being an entrepreneur has been uber (my favorite word) for me. I have had the opportunity to meet some many great people, doing great things. Not only do you have respond to emails, run your social media, and write blogs but you have to also keep your income flowing. Just like life, your business will have it’s ups and downs but when you’re a full-time entrepreneur, your income has to be consistent. Your business is no longer a hobby but a means to sustain your life. Creating consistent income is IMPORTANT. Diversifying your income is ideal in your business to keep income steady. 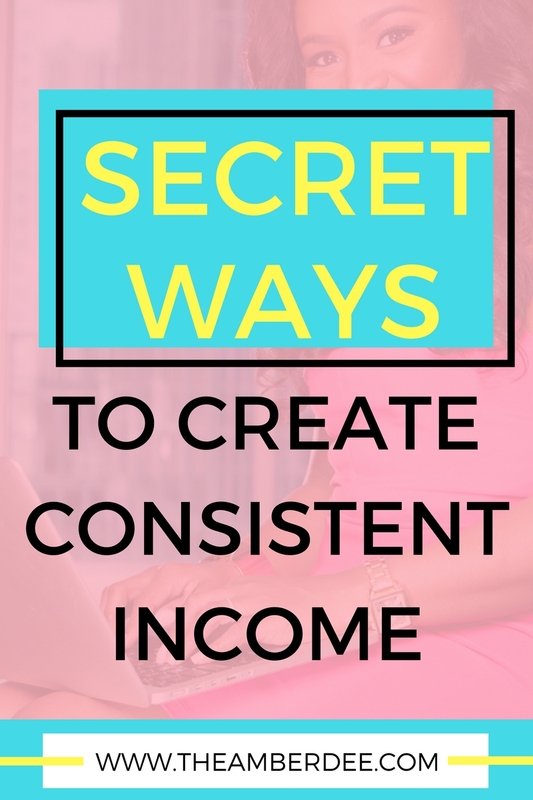 Let’s get into my tips for creating consistent income in your business. Think about what you offer that can be split into payments. Be sure to locate your high end products or services to break into payments instead of something small. For example, you wouldn’t want to make payments for a service that you have for $20. I know that’s extreme but I wanted to give you a visual. Focus on something with a higher price point like $500. You could break that into 4 payments over 8 weeks. This way you know what to expect each week or month from your customer which makes it easier for you to plan and stay consistent. Depending on what you offer, you can place your services on a retainer. Find a service that you can provide to someone monthly and create a fee for them to “retain” your services. Simply put, instead of someone paying you per project (i.e. social media graphics, website graphics, PDFs) they pay you upfront each month to conduct those services. TIP: Set a limit for each month (EX. $300 = 10 hours of service) to ensure you are not overworking yourself and not getting paid for it. Evergreen = never gets old. If you’re not creating content that is evergreen, it’s beneficial for you to start now. Evergreen content is relative information no matter what is going on in the world. For example, I could create a course about entrepreneurship because though the marketing strategies may change, the foundation of entrepreneurship stays the same. Creating an evergreen course is something you can always promote when doing workshops, speaking engagements, or podcast when you don’t have anything to sell. Plus you can create funnels around these products to have when people sign up to your email list. Affiliate marketing is where you get a percentage of money from tools or products you recommend to your audience. I’m sure you’ve seen influencers on Instagram posting about their purse, their clothes, or shoes. That’s one way of affiliate marketing but you can sign up for your own places to join. Here are a few locations you can sign up to without pitching what you have done. You can also look up current services that you are using now and join their affiliate network program. The options are limitless when it comes to passive income. Really take some time to sit down and review your business and the market that you’re in. What is something that your audience loves or frequently purchase? Figure that out and offer that to your audience. Planners, shirts, and office accessories are really good sellers for brands and groups alike. If you’re interested in chatting more about how we can monetize your skills, CLICK HERE to get on my calendar. In the meantime, have you already identified ways to keep your income consistent? If so, have they worked or have you found yourself back at the drawing board? Do you have other suggestions to add to this list? I want to hear about it below.